I love Indian food. If I had to choose a favourite cuisine, I think Indian would be it. We do have a few Indian restaurants not too far away from us (i.e. about half an hour´s drive) but I usually get my curry fix when I go to London. I was lucky enough to live in a neighbourhood that was predominantly Indian and African, so I was spoilt for choice in wonderful ethnic restaurants. Sometimes, however, my cravings get the better of me and I have to make curry at home. Big Man hasn´t ever really “had” the full curry experience, so doesn´t really understand my need for curry, but on the occasions I´ve made something “currified”, he´s enjoyed it. 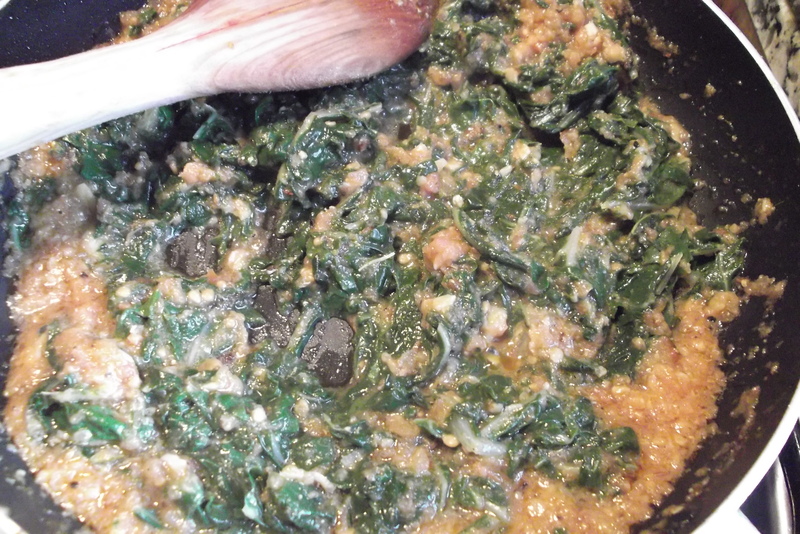 We currently have a lot of chard growing and usually eat it wilted with oil and lemon juice but I decided to substitute the spinach in a Saag Aloo (that´s a Spinach and Potato curry) for chard, and see how it worked. Fortunately it was a perfect substitution and Big Man adored it. I think he´s starting to become a curry monster like me! 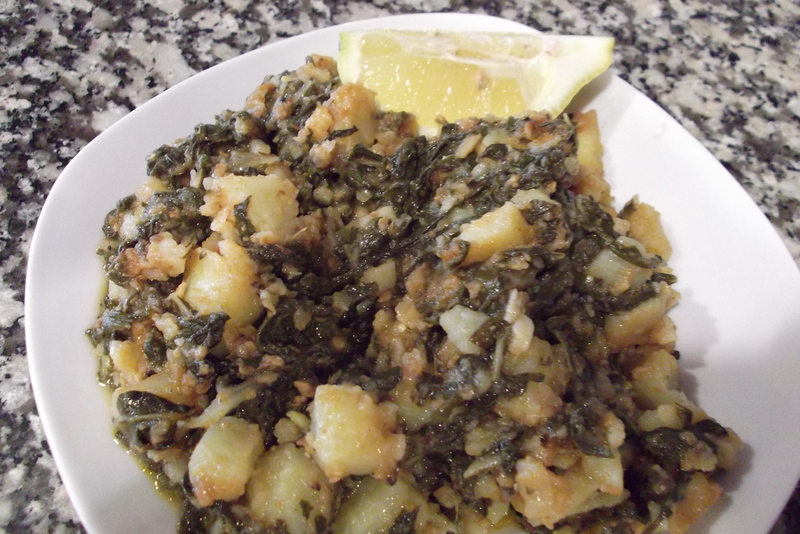 I lay no claims to the authenticity of the spices I use in relation to a real Indian Saag Aloo, but the combination worked well and had good spicy (but not too hot) flavour. 3 teaspoons of Garam Masala mix (you can buy ready made or make your own). I used a mix bought over by a friend which a chef friend of hers makes up and I then grind as I need it. 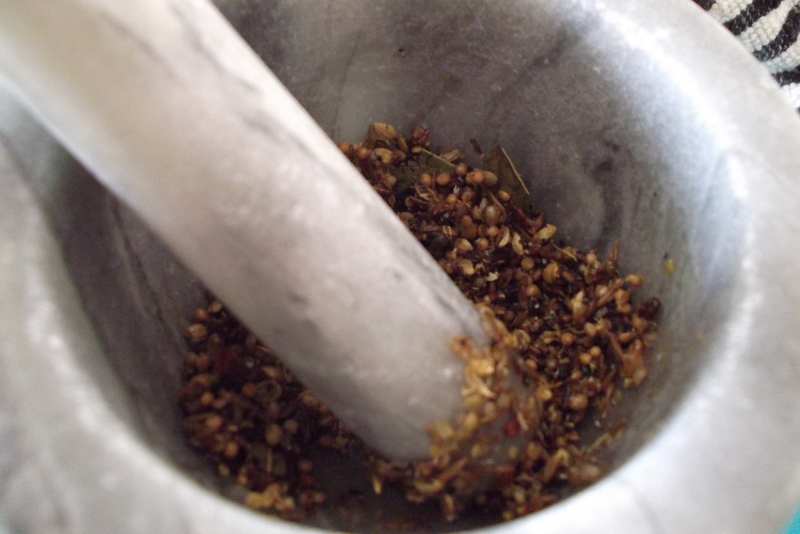 I don´t know the exact mix but I picked out coriander seeds, curry leaves, cumin seeds, black peppercorns, cinnamon and coriander. 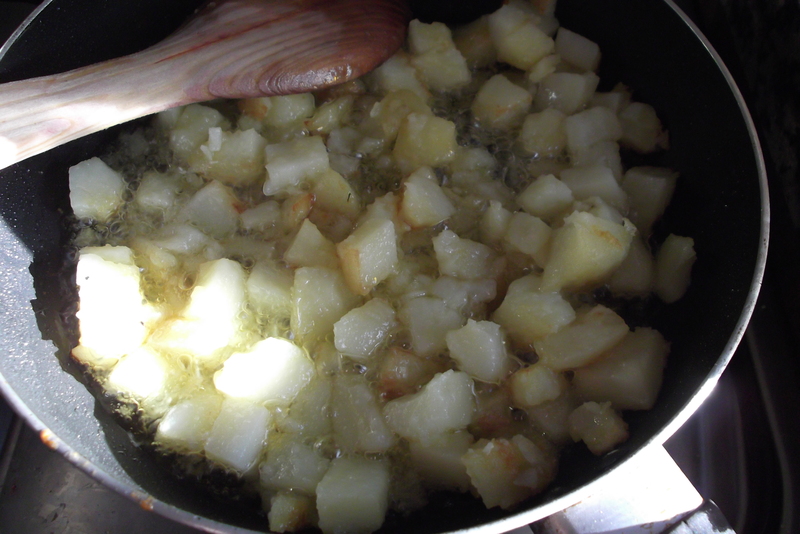 Start by frying the potatoes until lightly browned then remove them from the pan and drain off most of the oil. 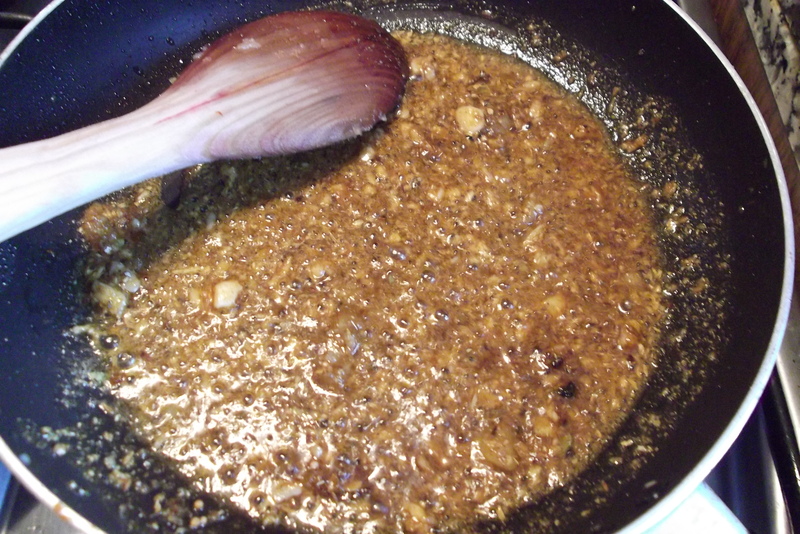 Fry the spices until they start to release the most wonderful smells and then add the garlic and fry until it softens. Add the tomatoes and simmer for about 5 minutes then add your spinach or chard. Put a lid on the pan and simmer for another 5 minutes or so then add the potatoes. Add salt, Indian food can take (and usually needs) a heavy hand with the salt, but use low sodium if you can´t use regular. Simmer, uncovered until most of the liquid has evaporated but all of the vegetables are coated in the tomato and spice sauce. I like this served with a generous squeeze of lemon juice. Can be served as a side dish or a main (vegetarian) dish with plain boiled basmati rice. Now, where are my popadoms?! Looks wonderful. I love there’s always something new to do with potatoes. Potatoes with potatoes as far as I´m concerned! Ain’t that the truth? Mmmm… and greens make me happy as well. I usually pair greens with beans, but this looks great! I’ll be trying it soon! Greens and beans sounds wonderful! We love our veggies here…but the potato works really well with the chard. Fantastic!!! I am not very familiar with Indian food since I grew up in Honduras, where there were no Indian restaurants. I love the fact that growing up in London, you had all these mixtures of gastronomic cultures, including Indian which is very diffused in the UK. I love curry and I sometimes “introduce” it to my husband when I cook some middle eastern recipes!!! And I have to say that he is beginning to like it!! Looks interesting. I’m not an Indian food person. I’m not sure I’ve ever eaten Indian food, but when I was pregnant with my first child we lived below an Indian couple and let’s just say Indian spices and morning sickness are not a good combo. I might try this. I’ll let you know if I do. What a great idea! We have so much chard in the garden at the moment and can’t keep up with it. I must try this. We used to eat a lot of Indian food years ago when we lived in Oxford and took it with us to Wales, where our children grew up thinking curry was traditional Sunday lunch, but here we don’t so much….but why not? Your postings always make me hungry! Yum. I like chard. It has so much more going for it than ‘cabbage’! Memories of pungent, wet cabbage at school haunt me to this day. Oh dear, school dinner cabbage…I used to hide mine under the lumpy mashed potato! 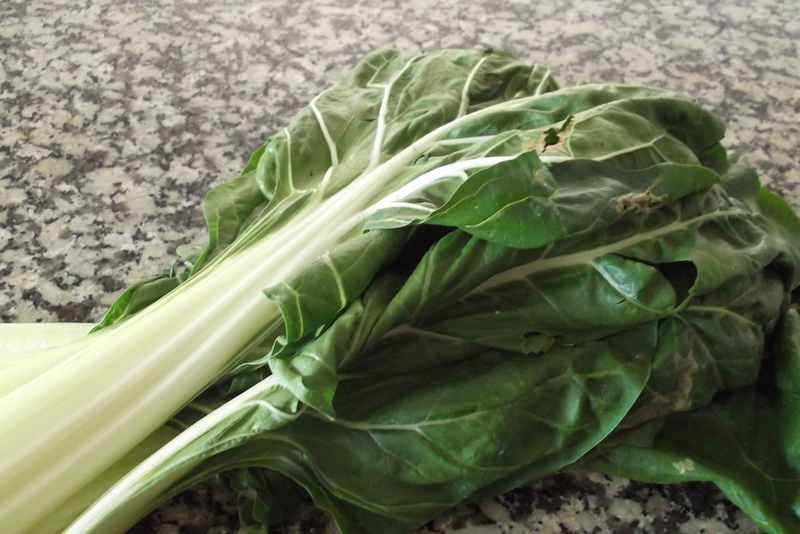 Chard is great, a nice slightly earthy taste but fresh too. Looks wonderful, your posting always make me hungry haha.